The National Aeronautics and Space Administration (NASA) released the latest in a series of photographs showing objects mountains, sand dunes and a layer of fog that was in Pluto. The photo also shows a shadowed craters, which are similar to craters on the Moon. The picture, of course, taken by NASA's spacecraft - New Horizons in July 2015 ago. Through a variety of detailed pictures of this, NASA researchers reveal more image of the landscape that looks at the dwarf planet. However, as reported by News.sky on Wednesday (09/16/2015), the dark crater plains bordered by hills and mountains made of ice. In addition, because Pluto has a thin atmosphere, then geologically hills and mountains that resembles a large ice could float. 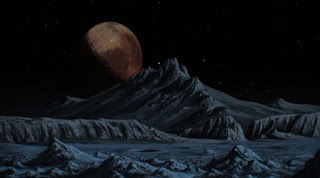 William McKinnon, geologists from Washington University said that the atmospheric effects that occur at Pluto had never observed by scientists. He reveals, Pluto certainly has a lot of mountains and hills that can be floating ice. "For now, it will be studied further," he said. Announcement of the successful mission aircraft expedition New Horizons Pluto uncover some time ago into the public spotlight. Obviously, after nine years across the solar system, New Horizons finally able to be inside the orbit of the farthest planet nearby. Sightings dwarf planet that was taken and uploaded directly through the NASA official Instagram page, In the picture looks Pluto from close range to the surface forming a heart pattern heart. So no wonder this planet was touted as the planet `hati` by many people.